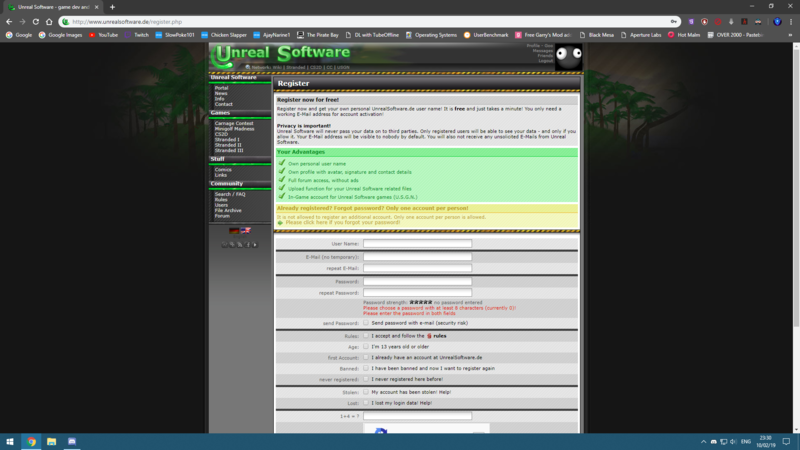 Unreal Software - Thread: Why can I register while logged in? Unreal Software Why can I register while logged in? Why can I register while logged in? Why can I sign up (haven't tested) while being logged in? There is no particular reason but disallowing it for logged in people wouldn't make any difference either. If someone wants to violate the rules he will do so. Logging out would be just one additional click. Most people (who create multiple accounts) probably do log out because the registration page is not linked in the navigation when being logged in. Of course there are also special cases where it can be legit to use that page while being logged in. E.g. siblings or friends using the same PC. One registered already and is still logged in and the second one wants to create an account too.